The Dog Flu is an illness or Condition usually involving respiratory distress and possibly other symptoms, such as fever. Being caused by the Canine Influenza Virus, this type of condition is therefore quite contagious. This is not an especially dangerous virus but, just as with humans, Flu issues should not necessarily be taken lightly, especially where fever may be involved. The body of the dog varies greatly from the human in this realm, as their NORMAL body temperature is up about 3 degrees from people. Where ‘normal’ in humans is around 98.6, dogs will be normal just under 102. In either case, allowed tolerance is about 1-degree, either way. 103 degrees in a dog is considered a ‘fever. And, when a dogs temperature reaches 106 F, the status has reached the point of “medical emergency”. If getting up into the 104-105 realm, seeking vet assistance is advised – as special ‘fever reducing’ methods may need to be employed. As for the dog flu itself and the symptoms, if not dealt with properly, the condition can lead to secondary infections that can be much more serious and/or life threatening. Slight Fever – 103-104 degrees F.
The dog flu is fairly new to America, with the first documented case dating back to 2004. 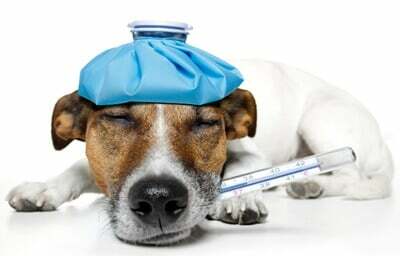 There is no evidence that a dog owner can catch dog flu from their dog. The canine influenza virus has only been cited in 30 US states, plus Washington D.C. (So check and see if the virus is prevalent in your state if you notice symptoms). Because of the lack of exposure to the virus, nearly 100% of dogs exposed to the dog flu will catch it and you will begin to see symptoms within 5 days. Common places dogs are at risk of contracting the flu are kennels, shelters, dog parks and doggie daycare centers . 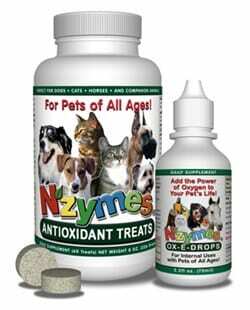 Over the years, NZYMES® has developed our special Healthy Respiratory Program to give Pet Parents a great alternative for getting such conditions – involving respiratory distress or challenges – under control fairly quickly. The nutritional support of our Antioxidant Treats can help with the stress on the body, providing resources to support the improvement of metabolic processes, especially immune performance. The Ox-E-Drops are used both internally (diet) and externally (vaporizer) to assist the body with the challenges of conquering the microbial invaders that must be eliminated. We have had a tremendous success rate in treating dog flu with our approach. Remember: Antibiotics do not treat viruses. Visit the Healthy-Respiratory Program page HERE – TO review Video instructions for using the Program.